BUSAN, North Korea – The general secretary of the World Council of Churches has made a call for urgent international action involving Christian churches and the European Union to deal with a worsening situation involving thousands of Africans trying to enter Europe. "The churches – together with all people of goodwill – must address the issue in a wider perspective," Rev. 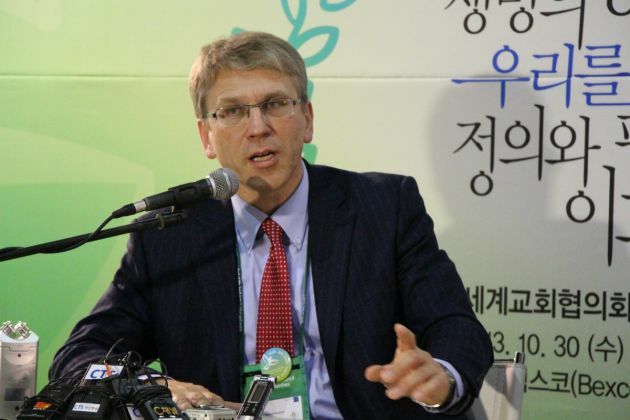 Olav Fyske Tveit told journalists at the end of 10th Assembly of the WCC, a meeting that takes place every seven years. "This is an issue which involves economic realities. We see refugees trying to enter Europe for a variety of reasons – climate change as well as political reasons. "The world has to recognize that many of them are moving for a variety of reasons. This is a situation that must now be addressed at an international level." Tveit was asked by Ecumenical News what action the churches in Europe must take to meet their Christian obligations to help Africans who, in small and often un-sea worthy ships and small boats, are attempting to enter parts of southern Europe. This is for a new life, but many of them drown in their attempts to cross the Mediterranean Sea. Tveit said that the churches in Europe will help the asylum seekers. "The churches' response is first to show Christian love and help individuals meet their basic needs. "I think that they really have a role to express their concern about what is happening and for the European Union (EU) to address these issues in a way that reflects the values of the organization on the subjects of human rights and human dignity." Answering questions about the value of the 10th Assembly held in South Korea's second city and hosted by local Christians, the secretary general said, "We have been overwhelmed by the hospitality and the generous contribution made by out Korean hosts and churches here." Korean Christians told him that holding the 10th Assembly in Busan had brought a new life to their own churches. Tveit said that the Assembly, which was attended by more than 5,000 participants from churches around the world, had shown both the richness and diversity of the international Christian community. "We have seen that the fellowship of the churches is a real fellowship. It is diverse and rich and shows a commitment by Christians to work together for unity, justice and peace in the world. "There had been a good inter-reaction between the young and the old and the young are the future if the WCC." Asked about the on-going division of the two Koreas he said: "We have seen how an unsolved conflict is not only a reality but also a burden." Yet, the division of the two was not just a problem for Koreans. "It's also a problem for the whole world," Tveit declared. Asked about the presence at the 10th Assembly who had attended for the first time he said - "I think it is remarkable that the Chinese Christian Council which is a member of the WCC is present here and also that church expresses its wish to work with the ecumenical movement through the WCC. "The presence of the Chinese at a WCC Assembly would have been impossible to imagine two or three decades ago." The North Koreans did not attend. Asked about Roman Catholics at the Assembly, Tveit said that they were the single largest delegation. "We welcome that very much. We appreciate the official and quite substantial relationship which we have with the Pontifical Council for Promoting Christian and through, The Vatican and the Holy Father."